Client: Joe Petrocelli, J.Petrocelli Construction, Inc. This new five-story hotel consists of one hundred guest rooms, an informal lounge, and riverfront pool and deck area. The site is next-door to the Atlantis Marine World Aquarium, located on the Peconic River, has access to a marina. 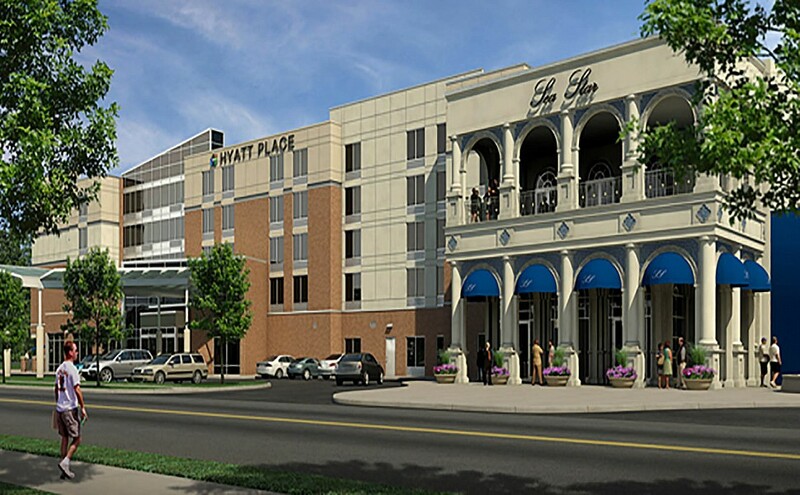 The structural framing system for the Hyatt Place Hotel consists of 8” and 10” thick pre-stressed, pre-cast hollow core concrete planks with 2” concrete topping slab supported by 8” wide reinforced load-bearing masonry walls at building exteriors and one of the interior corridor walls. Wind and seismic forces on building are resisted by reinforced masonry shear walls. The foundation system consists of 20 tons capacity pressure treated timer piles placed in a staggered layout and caped with continuous concrete grade beams for load-bearing wall support. Construction of the facility was completed on time and within budget in July 2011.